The use of GRP profiles in offshore constructions is becoming increasingly commonplace. US composite profile manufacturer Fiberline Composites has supplied a glass fiber reinforced composite lifting yoke to replace a more heavyweight steel construction. The large lifting yoke used by Eltronic, a supplier of equipment for transporting wind turbines, was so heavy that its weight was becoming a problem for Eltronic's customer. Eltronic Heavy Industries therefore teamed up with Fiberline to find a lighter solution. ‘We simply had to reduce the weight,’ said Kenneth H Svinth, CEO at Eltronic Heavy Industries. 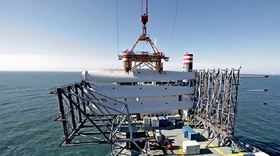 The lifting yoke is used for installing individual blades on offshore wind turbines, and the customer, an offshore wind turbine producer, wished to switch to using a faster and smaller crane for the task. This could only be done by reducing the weight of the yoke. Eltronic therefore contacted Fiberline Composites to discuss using GRP profiles, which in direct comparison with steel weigh only about 25%. Much of the manual work takes place at a height of 8 m, and Eltronic guarantees that the turbine blades, which are 75 m long and weigh 25 tonnes, can be lifted into place in wind speeds as high as 14 m/s. ‘We found that GRP [glass fiber reinforced plastic] is just as reliable a material as steel,’ says Kenneth H. Svinth. Eltronic's platform measures 15 x 6m, weighs a total of 3 tonnes and incorporates 205 m of GRP profiles and 107 m2 of GRP gratings joined together using 2,500 acid-resistant, stainless steel bolts. To date, the collaboration between Eltronic Heavy Industries and Fiberline Composites has resulted in five GRP platforms. This story is adapted from material from Eltronics, with editorial changes made by Materials Today. The views expressed in this article do not necessarily represent those of Elsevier.